Dinner last night was a bit of a cleaning out of the fridge. We had some veggies that needed to be eaten, some ground turkey that needed to be used or frozen, and a bunch of bell peppers. 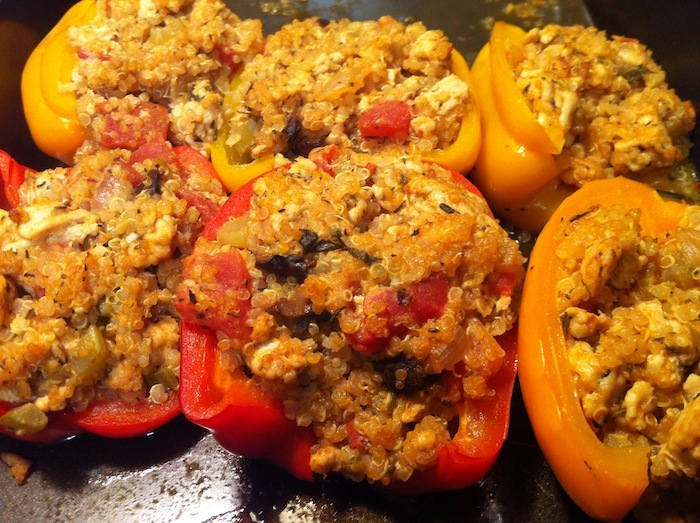 Naturally stuffed peppers came to mind. Figuring out what to stuff in a pepper takes a little creativity. I knew I wanted a whole grain involved, but I didn’t want to spend a lot of time cooking up barley or something. I like having something kind of creamy/cheesy in my peppers. I knew I had the protein covered with the ground turkey. And I always like to have as many veggies as possible in any meal. So those were my guidelines. I did a little bit of recipe searching and found a basic recipe to follow for quantities/timing, and lo and behold, dinner was born. This turned out really well! I used goat cheese which melted into creamy decadence. 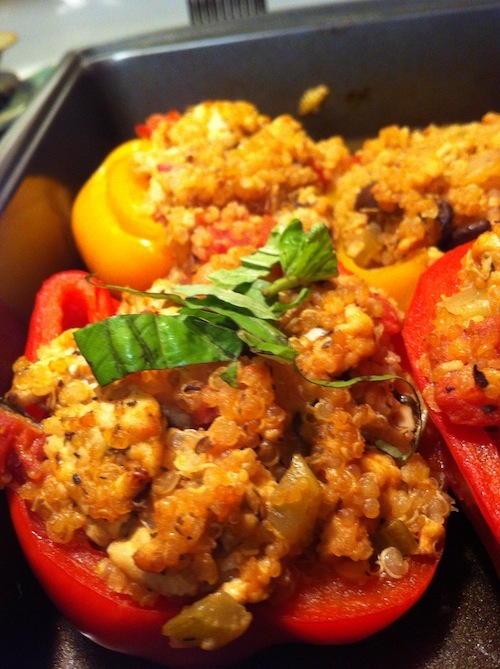 I used quinoa as the grain which adds a lovely nutty flavor and absorbs the creamy melted cheese and the juice from the tomatoes. I like to cut the peppers in half before filling them so that your pepper is overflowing with filling, but if you prefer the look of a whole pepper being filled that works too. All and all this turned out perfectly for a use-what-you’ve-got recipe. In a small sauce pan, toast your quinoa over medium-high heat until it starts to pop and smells fragrant, stirring occasionally. Add water and salt. Bring to a boil, cover and reduce heat to simmer for about 10 minutes, or until all the water has been absorbed. Meanwhile, heat olive oil in a large skillet over medium high heat. Sauté onion, celery and mushrooms until tender. Add garlic and cook for another minute. Add turkey, breaking it up with your spatula as it cooks. Mix in tomato paste and salt. Stir in tomatoes and goat cheese. By this time your quinoa should be done, so stir that in as well and remove skillet from heat. In a nonstick pan, line up your pepper halves, scoop filling into each half. Cover the pan tightly with foil and bake for 30 minutes. Remove pan from oven, carefully take off the foil and garnish the peppers with fresh basil. Serve and enjoy! True story: this sounds almost exactly like what I made last night to bring for lunch all week. Except I didn’t use goat cheese! That’s brilliant.